Oyster shell is a valuable resource in the state of North Carolina. 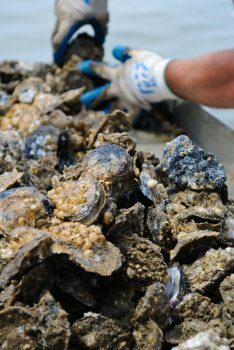 It is used by the federation, N.C. Division of Marine Fisheries and others to build new oyster reefs. To get the material that is needed, shells are often bought from shucking houses and delivered to project sites for $2-3 per bushel. A recycling program provides an alternative way to collect the shells that may otherwise be improperly disposed of. This type of program gives both restaurants and private consumers a chance to return their shells to the water. From 2003 to 2013, the state of North Carolina ran a state-funded shell recycling program. Through the program the Division of Marine Fisheries provided centralized drop off locations, the collection and transportation of shells from restaurants, festivals and oyster roasts and the maintenance of dumpsters. From 2013 to 2018, they ran a scaled down program with limited grant funding that provided drop off locations for collecting the shell. While operating, the program provided 6-15% of the needed material for restoration activities. Unfortunately, due to budget cuts and a reduction in staff, as of 2018, all state-run oyster shell recycling centers have been removed in North Carolina. A few counties, municipalities and organizations have stepped up to fill the void. Shells can be brought to a limited number of collection points along the coast. The federation stepped in to develop a pilot program in the northeast region. For the past two years, 12 volunteers have worked to pick up shells from three participating restaurants – Blue Water Grill, Sugar Shack and Coastal Provisions – and deliver them to two drop off points in Dare County. The frequency of collection varies seasonally, increasing in the busy summer months and slowing down during the winter. Impressively, in 14 months, the volunteers collected over 1,100 buckets of shell, weighing more than 16 tons. The benefits of this program include opportunities for community engagement – both with volunteers and local restaurant owners, while serving its environmental purpose of returning the shells to the water where they will make important oyster reefs. The federation plans to continue this program and hopes to grow the number of volunteers and restaurants involved along the northern coast. For more information please contact Leslie Vegas at lesliev@nccoast.org. In the state of North Carolina, it is illegal to dispose of oyster shells in landfills or use them as mulch for landscaping since they are needed for reef building in our sounds.